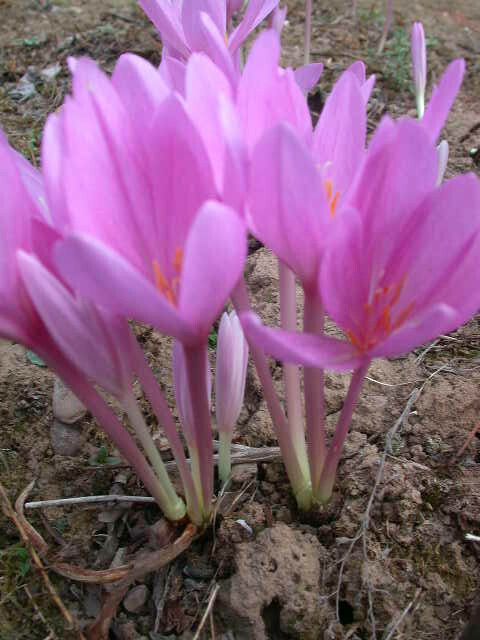 These easy atumn flowering corms produce their crocus like flowers in September and October before the leaves appear. They are not related to crocus and have a large irrecular corm . The broad leaves appear in the winter and last until early summer. They are sometimes called 'Naked Ladies' as the flowers appear before the leaves. One of the very best with large, well-chequered flowers of rich lilac-pink. with a bold white centre. It does best in fertile soil in part shade under shrubs where the large, persistent leaves are a bonus and not a problem. It increases well. Bright violet-mauve flowers with a central white line on slender dark stems. A delightful and easy form of C autumnale from Romania. One of the earliest to flower, often out at the end of August.It does best in fertile soil in part shade under shrubs where the large, persistent leaves are a bonus and not a problem. It increases well. We have decided to discontinue growing these and are offering mixed varieties only at a reduced rate. Most will be shades of pinkish purple Though there may be the odd white this cannot be guaranteed.